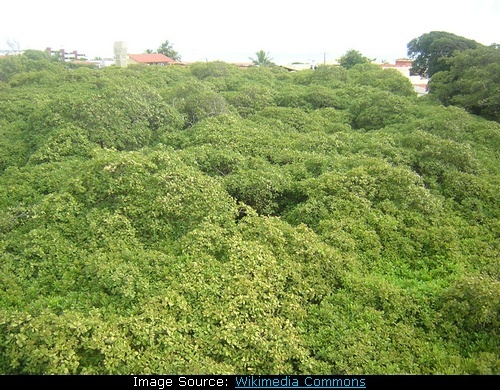 World's largest cashew tree, known as Cashew Pirangi, is located in Pirangi North Beach area of Parnamirim in Rio Grande do Norte state, Brazil. Normally a cashew tree grows to a height of 10-12 metres and has a short, often irregularly shaped trunk. 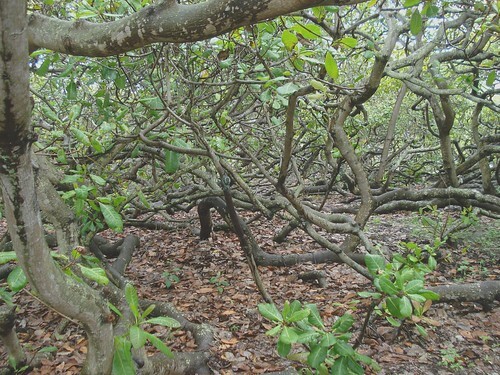 However due to two genetic anomalies the Cashew Pirangi Tree has spread side ways to an enormous size. Firstly instead of growing upwards, the branches of this tree grow sideways and in due course of time the branches tend to bend down due to weight and touch the ground. Then due to second anomaly, when touching the ground, the branches begin to create roots and instead turning upwards again the branches take root and begin to grow again as if these were roots of another tree. Thus the tree propagates on its own and spreads sideways - more or less like a Banyan tree with aerial roots. This unique tree was planted in 1888 by a fisherman named Luiz Inácio de Oliveira. By 1955 the tree had spread to an area of 2,000 square metres and by 1994, when it was listed in the Guinness Book of World Record, the tree had grown to a circumference of 500 meters, occupying an area of 7,300 square metres. Presently the tree has a spread of 8,500 square metres. Reportedly it is now threatening the nearby road but the authorities don't want to trim it for fear of damaging it and stunting its growth. 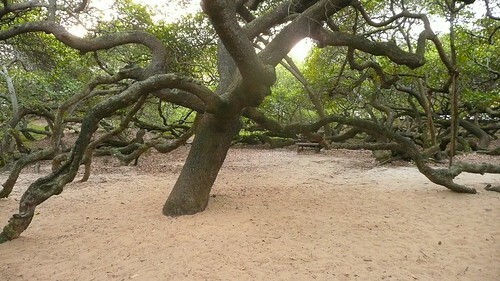 The tree is a popular tourist attraction and to the visitors it appears that they are entering a forest. Even from air it looks like a multitude of trees whereas in reality it is just one tree with multiple roots and trunks. A Brazilian magazine "Cruise" in 1955 described the tree as an "unfinished symphony" of "twigs cast in geometric progression". It is estimated that each year the tree produces about 80,000 cashew nuts.